LONDON—Nothing says English sport like the ripple of polite applause at Wimbledon. Except perhaps the anguished cries and hearty bellows of English football fans. Those two worlds are set to collide this year, as England is gripped with emotional fervor after reaching the semi-finals of the World Cup for the first time in 28 years—just as the Wimbledon tournament also reaches its climax. But Wimbledon organizers are keeping a stiff upper lip, refusing to show any football on the tournament’s big screen, in an attempt to reign in any ungentlemanly behavior. However, as the nation gears up to watch England battle Croatia on July 11 for a place in the final, the All England Tennis Club has made a concession: Fans will be able to follow the action on their phones and tablets using the tournament’s Wi-Fi signal. Should England reach the final, tennis fans will be even more torn—the World Cup final is scheduled for the middle of the Wimbledon men’s singles final. Football hopes are running at their highest since 1996, when England played (and lost to) Germany in the semi-final of the European Cup. That game was broadcast on the big screen at the Wimbledon grounds. But the Wimbledon managers have learned their lesson from that foray into the footballing world. 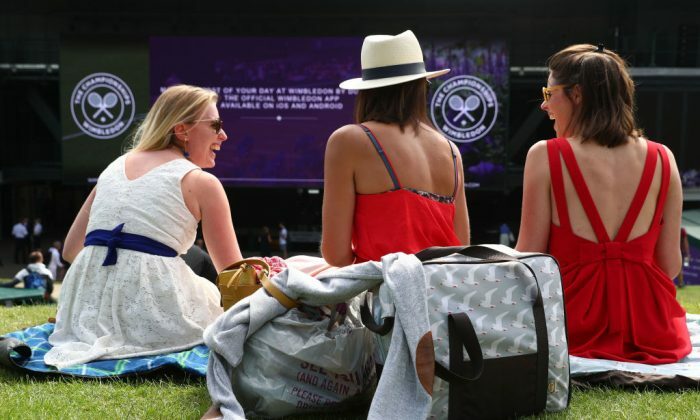 “I gather it wasn’t very successful because it did interrupt people’s enjoyment of the tennis and what we did last Saturday actually did work very well,” said Wimbledon chief executive Richard Lewis. “Saturday [when England played in the quarter final] was a fantastic day at the championships. We had superb tennis going on and we were benefiting from modern technology where people were able to follow the football, enjoy it, without disturbing other people. England’s rise through the World Cup tournament has dispelled decades of frustration at past dismal performances. Those failures have rankled all the more for the nation’s long footballing history, obsession with the game, and venerated world-class football league. The World Cup final in Russia is due to kick off on July 15 two hours after the traditional 2 p.m. start of the men’s Wimbledon final—meaning a very likely overlap. Lewis said he had not asked FIFA to consider moving the World Cup final to a different time. “We are a sold-out event and there’s massive interest. There are absolutely no plans to change anything,” he added. Tennis superstar Roger Federer countered the football fever with a little irony. “I’m more concerned the World Cup final will have issues because the Wimbledon final is going on,” he said. “They’ll hear every point, wow, love–15, 15–30,” he said.